By now you've probably heard today's announcement regarding the 2011 Nobel Prize in Physics. 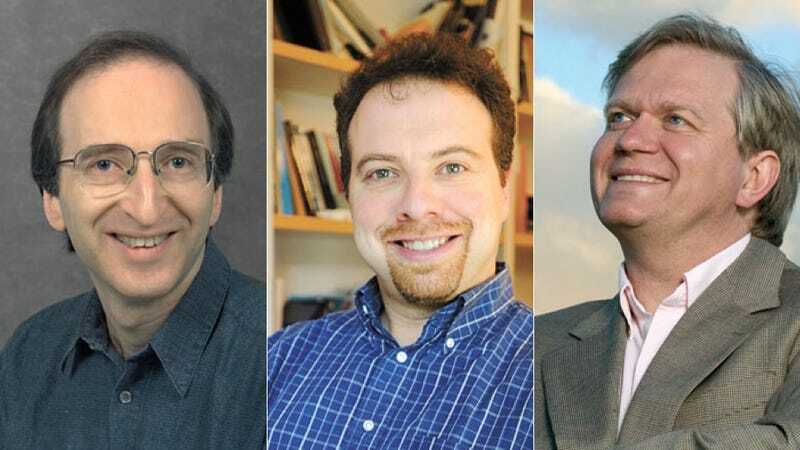 Three U.S. scientists — Saul Perlmutter, Adam Riess, and Brian Schmidt (picture left to right up top) — were honored for their 1998 discovery that our universe is expanding at an accelerating rate. But what does that mean exactly — "the universe is expanding at an accelerating rate?" Why is it an important discovery? How did it change the field of cosmology forever? And if the universe is expanding, then what the hell is it expanding into? I could try to answer these questions, but why do that when the Nobel Laureates themselves have already gone and done it for me? Scientific American has a couple of excellent pieces where today's Nobel Prize recipients do just that. The first feature is a Q&A session with Perlmutter about the discovery of accelerating universal expansion, originally published in 2008. The second an in-depth feature, written by Adam Riess and Michael Turner in 2004, on the use of supernovae to study the expansion of the universe. Both articles are exceptionally well put together, and they both definitely warrant a read.